These instructions are to coincide with the Islamic binding lessons that we have been having with Kristine Rose from the Fitzwilliam Museum. The two sewing stations must be prepared in advance of sewing as the paper is not good enough quality to work blind on the book, this can be done by piercing the paper or by scoring the stations with a knife. Commonly sewing was in yellow silk. Sew the first two sections twice as it is not initially sewn off, then continue to sew using link stitches. For sewing off, make the final stitch a kettle stitch, so that it is secured. Knock sections up between boards and put into a laying press. Stipple a small amount of paste into the sections to stick initially, then repaste with stippling and put spine lining on and bone folder down. The spine lining should be an evenweave linen, commonly mauve was used. 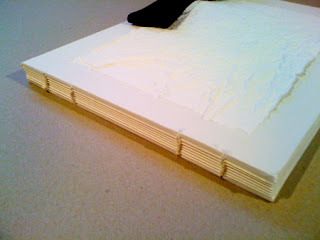 Excess linen is to be trimmed and pasted to the book block. This will be hidden by the board attachments. The linen should only be a couple of millimetres either side of the spine. End band cores should be the same material as covering, cut 3mm and just wider than the text block, these are to be glued up on the flesh side of the leather and moulded so that no fibres stick out. The cores should then be stuck onto the spine, adjacent to the spine and just hanging over either side. Each section centre should then be marked. Primary thread – this should be a bright colour, often a gold, so that it can be seen in contrast to the other two. This is sewn through every section and over the cores, which creates the basis for the second two threads. Tertiary thread – this follows the secondary thread on each row, going ‘under the overs’ and ‘over the unders’ meaning that every time a secondary thread goes over the primary, the tertiary will go under both, and when a secondary thread goes under a primary, the tertiary goes over both. The tertiary then anchors the secondary at the other end, allowing the secondary to weave back through the primaries to the starting point. Once the tertiary has come back and two rows are complete, there should be a chevron pattern starting. These two rows are then shuffled along the primaries to sit on the text block, before the next row is started. Tie down end band knots within the text block. Trim decorative end papers just smaller than first sheet and wet before pasting. Paste just over the fabric on the spine and press. 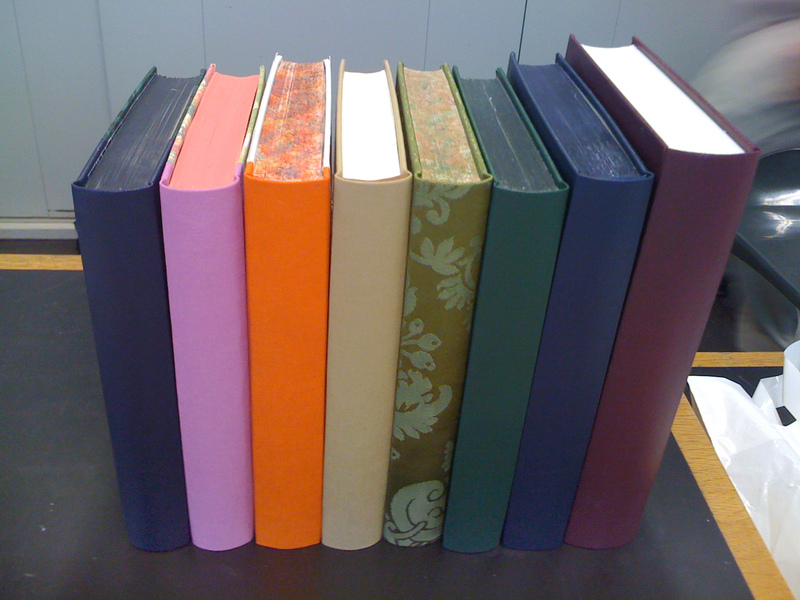 Once pressed, trim any excess decorative papers. Pair endband cores very slightly and paste down onto book cover. 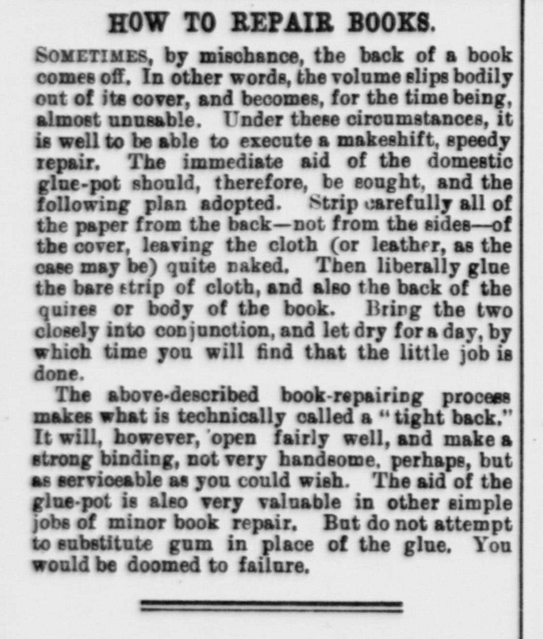 Paste and fan out text block threads onto spine. Three boards are used per cover, which should be lightly wetted prior to pasting. Boards are exactly the same size of text block in height, though not in width – Square up one corner of board and measure against cover of book, leaving a joint space at the spine, about the same size as the endbands, trim the boards to this size once pasted. Leave boards sharp without back cornering them. The foredge flap will only be the thickness of one board not three, and will be done when covering the book. The foredge envelope will be as the covers and three board thicknesses. It should be the same height for the boards and measured to exactly half the width of the boards. The point is central and the depth of the angle is half the width of the envelope. 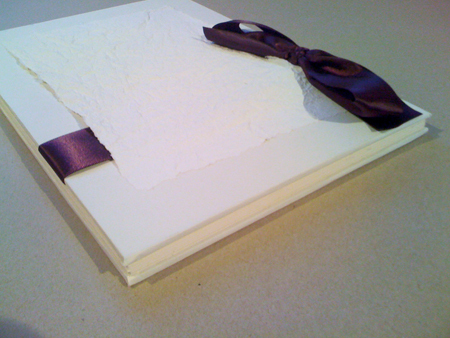 This is the last book in the series of Books for Becca’s wedding, it is the all important guest book! 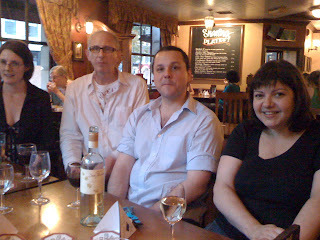 As I am writing this, it is the day before the big event, and I shall take more pictures of the book when it has been fully used by the guests – I might have had a little fizz by then, so we will see how those pictures turn out! It is in the same style as the previous two books, though much smaller, the pages are a landscape A5 size, rather than the previous A4 and bigger. 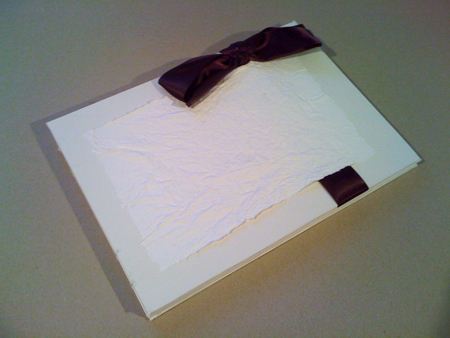 It is still bound in a simple coptic style and has the crumpled paper and ribbon on the front. Again it is in pink as this is the theme of the wedding! You may recall that some time back I made a book for a bride – my oldest friend, who is getting married in August. Well the weekend just gone was her hen-do – a raucous event of karaoke and champagne amongst other things! 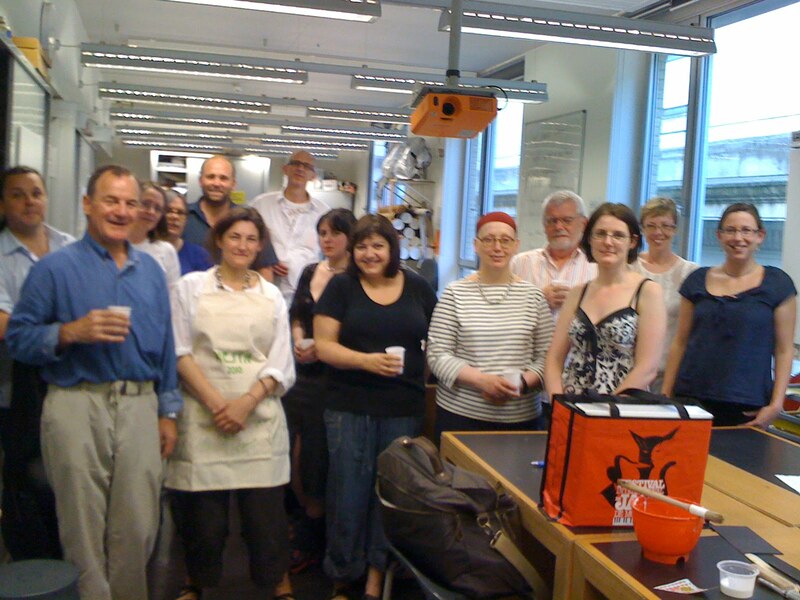 And, as many hen-do’s do – this one required a hen book! This duty obviously came my way and I endeavoured to make it well and in the style of the previous one so they matched. A nice part of this book was that all the chicks (is that the term??) had a huge input into it, as they made their own pages for the book, as apposed to giving me their pictures and notes and me putting it all together. It worked really well and I think the bride was quite chuffed! In leaving the pages up to the girls, I had to give them specific instructions as to the layout so that when I got them, they were similar enough for me to bind together in a book like structure. The plan was to have two landscape A4 sheets that I could stick together in the middle and then sew through. I used pink guards to make them more similar and give extra support, which matched the paper on the cover. That, along with the ribbon and scrunched up paper, meant it all came together nicely and matched the previous one quite well! As many of you will know, my oldest and best friend is getting married next year! – Very exciting, and as I am to be a bridesmaid! I believe it is tradition for a bride to have a book to keep all thoughts and pictures in prior to the wedding – a bit like a scrap book for potential dresses and locations etc. My friend is extremely organized, and already has most of it planned – including the former two items – so her book may be a little empty! 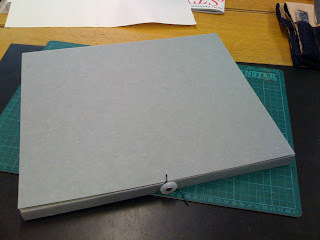 However, that does not mean she didn’t need a book, so diligently I went about making one, and am showing you the results! 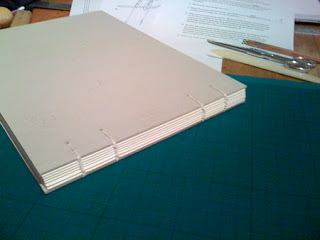 As you can see, I have taken the design from my previous coptic binding, only this one is smaller with more pages. I still need more practice, but considering my last coptic binding, this is a great deal better – hopefully my next one will be even more so. I haven’t quite got the knack of the link stitches, but I think one more try and I’ll have them right! Yesterday we did manage to complete all sorts of bits and bobs and I am fairly sure we all came away with our final project 2 books – so well done to everyone on that! I also managed to complete my phase box, which I must admit is pretty much just as bad as the coptic binding it is encasing – I think perhaps a smaller book would have been better to start with, so I think I will try that again. I have added some more pictures onto Facebook, in our new group page that Katherine has kindly set up called ‘Bookbinding 2010‘, which I think we should rally to change to the ‘Montague Binders’!! 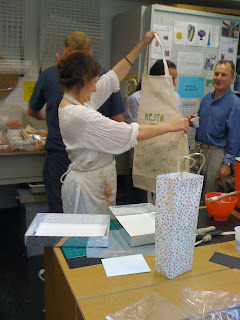 And finally, thank you very much Nesta for such an enjoyable year, I really have had a fantastic time! So I’m going to try and make these shorter and more snappy and keep everyone more excited! Last night was a manic array of different projects all fighting to be completed. Some people were ploughing, others like myself, were working on their coptic bindings and some on their rounded backs! I managed to complete my coptic binding and cover it and start the phase box for it, but due to the manicness, I have no pictures. We will be continuing the phase box next week, so I’ll take some photos then. Its not a slip case, more of a very fancy protective envelope, which at the moment isn’t going too badly. Sadly the actual binding itself is still pretty rubbish, but I will have to practice the technique more. I do have the attached picture to interest you, which is a little snippet my lovely sister sent me, which she found whilst researching for her studies. It’s from the London Journal Ladies Supplement and she thinks dates back to around the 1880’s – I rather like it!